The BEST Kid Birthday Party Theme EVER! My kids are kind of funny with their birthday parties. 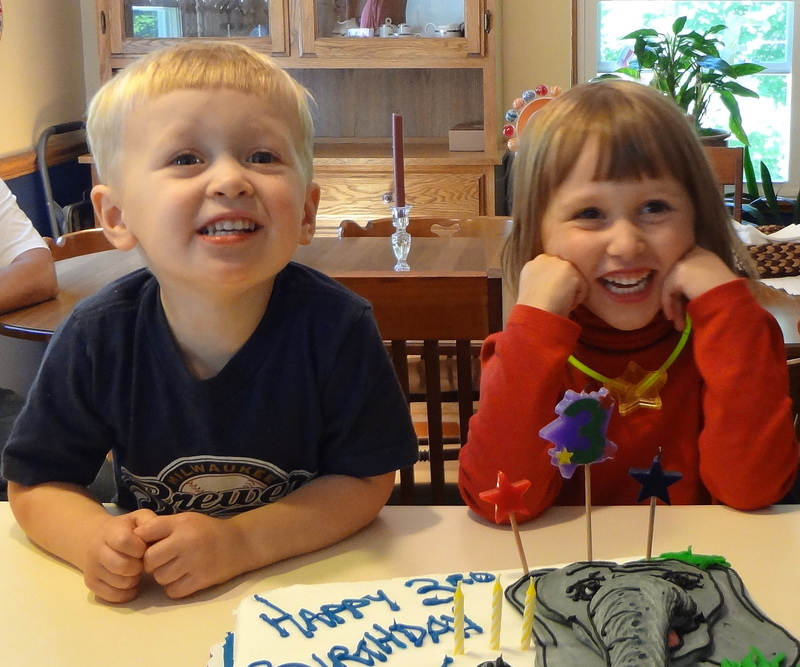 I typically suggest what they might want on their birthday cake and then plan their party from there. For my son, I suggested a Thomas the Tank Engine cake, and he said yes. My daughter, overhearing this conversation, said, “Don’t you want an elephant cake?” This made him change his mind immediately. 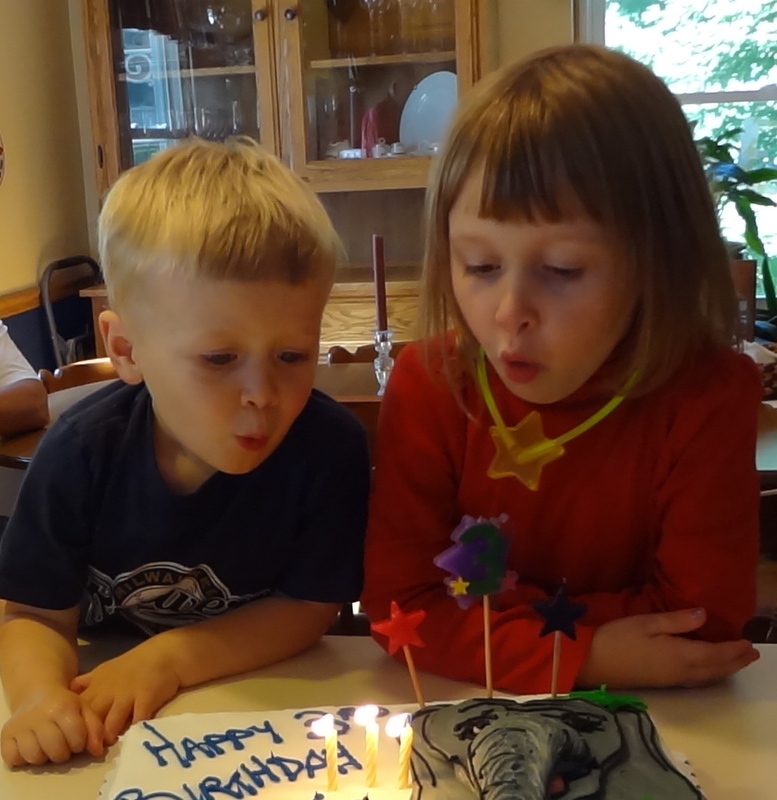 Yeah, yeah – an elephant cake! My first reaction: how in the world can I make an elephant cake?! I did what any mom / party planner would do, check out Pinterest! I came across this amazing Vintage Circus Theme 1st Birthday post on Hostess with the Mostess. The pictures are beautiful and the ideas adorable! It is a much grander party than we’d be throwing for our son’s 3rd birthday, but really really fun! I pinned a few other ideas on my Kiddos board as well. One stop to the dollar store for Popcorn containers, crepe paper, balloons and some favors, and I was completely “all-in” on the circus themed birthday with an elephant cake! It’s official – the circus party IS the BEST Kid Birthday Party Theme EVER! 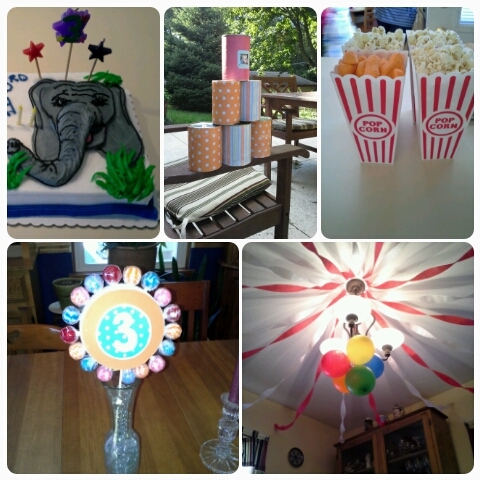 Love the circus themed party with an elephant cake, knock the can over game, popcorn & circus peanuts, lollipop centerpiece, and “big top” tent over our table. The basic color combination was so easy to do…a balloon bouquet hanging from our chandelier and crepe paper arranged to make our dining room feel more like a circus tent were really cute! I did spend more time making the centerpiece, using a Styrofoam circle as a base. I shoved the colorful lollipops around the circle and covered the front & back with scrapbook paper and a #3 cut-out. For the circus game, I covered tin cans in scrapbook paper. From an 18 month old to a 6 year old cousin, every kid had some fun (in their own style) knocking over the cans with a ball. Our menu included brats & hot dogs, popcorn, circus peanuts, animal crackers, veggies & dip, pasta salad, cake & ice cream – kid-friendly, fun food of course! 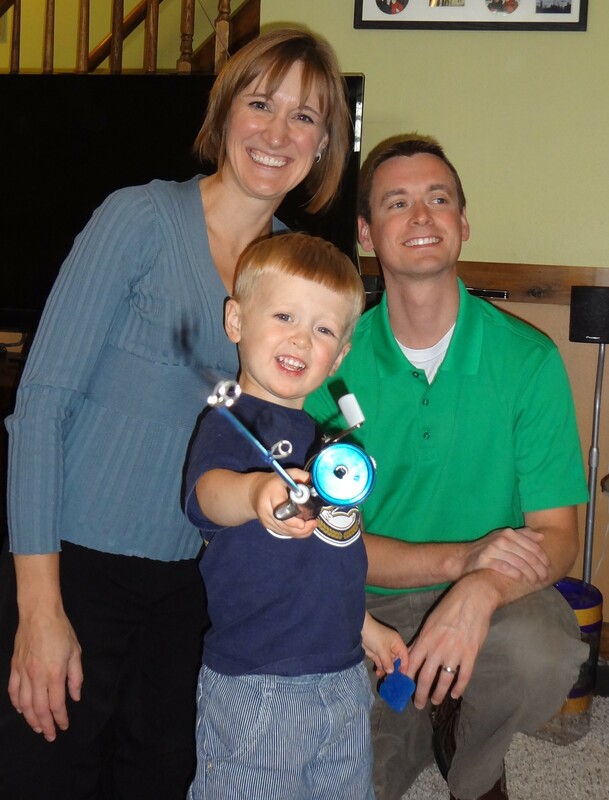 Little brother turns 3 – showing off his fishing pole with Mom & Dad. This was the best family picture we got! As you know, parties can be a bit hectic, so we forgot to try for a picture with all four of us. This one is so typical of family pictures – not looking at the camera, waving a toy around, somebody talking…but whatever, it captures the fun of the day, so I’ll take it. Little brother was so excited about his Star Wars fishing pole! The store bought, professionally decorated birthday cake was a hit! Thanks for the idea big sister! I caught my son saying “cheese” in this shot. A little help blowing out the candles. Kids just can’t resist helping blow out birthday candles. In a wider shot, their cousin was also helping blow from a distance. It is so sweet seeing the bigger kids help out the birthday boy….they especially did this while opening his presents in one crazy whirlwind. The room became extra quiet when all the gifts were opened and everyone was playing with his toys. So. Much. Fun. Have you ever had a circus themed party? What have been your favorite party themes? My next party theme – PRINCESS!! This entry was posted in Family, Kids, Motherhood, parenting and tagged birthday themes, celebrating, celebrations, kids birthday, kids parties, memories, milestones, Parties by Cathy O. Bookmark the permalink. So sweet! The pictures are darling. Looks so much like my two! Love the photos. Awh! Thanks. I’ll check out your blog too! You make it look so easy. Looks like the birthday boy had a blast! Awh – thanks! I like to plan in advance to make it easier! What a fun looking party! I think my favorite themed party was the tea party we threw for BB a few years ago with a slight Oliva-themed color scheme. Lots of red and white and black basically. I think what I liked about it though was the simplicity of the party – my favorite parties seem to be the ones that feel very effortless and carefree. Yes! Effortless and carefree are great! I agree on the red and white colors…so simple and festive, not to mention UW-Madison colors (my alma mater)! Have a lovely weekend!